Since SpaceDHL and starUPS didn't start to compete on the intergalactic fast shipping market, some students thought of a method to deliver a parcel to Earth using just gravity. 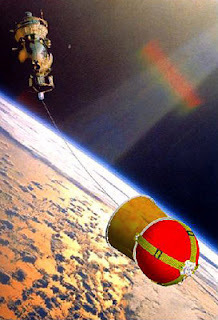 At an altitude of about 300 km, a half a millimeter thick, 30 km long tether will be released from the Russian research capsule Foton M3. From the tether will be attached the result of YES2 project, the "parcel", Fotino. Due to the gravity, the parcel will start swinging up and down. The parcel will be released and placed on a path towards Earth.